Apple is said to have purchased Cue, a startup company behind a personal assistant app for iPhone which shut down just this week, AppleInsider has learned [updated with confirmation]. An anonymous tipster claimed on Thursday that Apple is buying Cue, which was formerly known as Greplin, for between $35 million and $45 million. The startup was a Y Combinator venture capital alumnus that reportedly obtained funding from both Sequoia Capital and Index Ventures. The source shared that although Cue never disclosed their latest funding round, the company allegedly raised $10 million from Index Ventures. The information provided could not be independently verified, and Apple declined to comment. 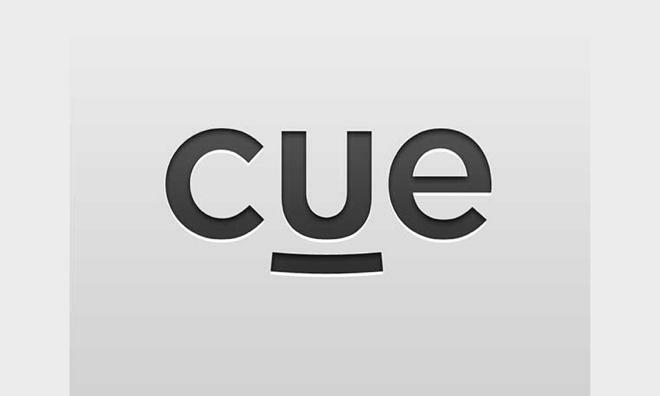 Update: Later on Thursday, TechCrunch independently confirmed that Cue has in fact been purchased by Apple. They were told that the price tag for the company could be between $50 million and $60 million. Apple affirmed the acquisition, but as usual declined to offer specifics. Cue's functionality was much like that of Google Now or Apple's new iOS 7 contextual notifications, though it debuted before both of those services. AppleInsider was previously tipped in mid-September by another person who claimed at the time that Apple was in talks to acquire Cue. Cue announced to its users on Tuesday that the service is shutting down and is no longer available. Cue Premium users who bought a paid subscription, either through official iOS app or the company's website, will receive a prorated refund. "We apologize for any inconvenience this might cause you," the company said. "It's been an incredible journey that wouldn't have been possible without your loyal support." 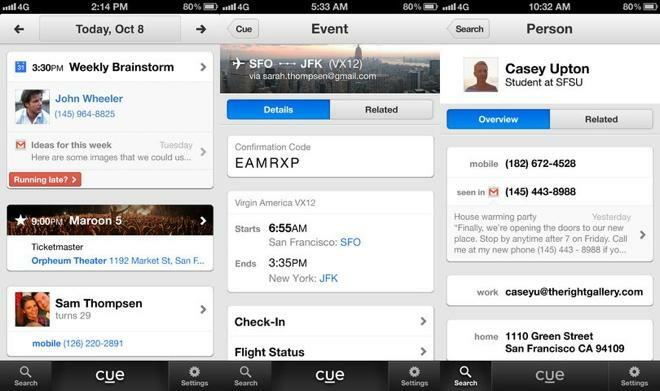 Cue's iPhone app, before the service was shut down. Screenshot via Blue Wheel Media. Cue's functionality was much like that of Google Now or Apple's new iOS 7 contextual notifications, though it debuted before both of those services. Originally founded as Greplin, the company would index content from social networking sites like Facebook and Twitter, as well as pulling data from Gmail. For example, a single search for "Jim" would surface contacts from the user's LinkedIn account, emails from Gmail, and documents from Dropbox. The company transitioned in 2012 to become Cue, and offered a personal assistant application for Apple's iOS that would automatically turn data such as flight or restaurant reservations into a daily agenda. Cue would accomplish this by collating and indexing a user's contacts, files, and emails, then display important and timely information. The company was founded by entrepreneurs Daniel Gross and Robby Walker. Cue was formerly run by Greg McAdoo, who was also previously associated with Bump, a company acquired by Google earlier this year for at least $30 million. McAdoo has since moved on to become a venture capitalist at Sequoia Capital.